This morning we woke to a cloudy, breezy morning, but we weren’t too concerned as it was forecast to brighten up as the day progressed. The Chef spent much of the morning involved with getting our laundry washed and tumble dried. The driers were really slow and both machines ate more money than a Vegas slot machine. In the meantime I busied myself with a few maintenance jobs on the RV. After lunch we took a ride back in to the main tourist area of Geneva-on-the-Lake. We parked our bikes next to a couple of weekend Harley bike users and wandered along the main street. We even decided to sample some wine from a local winery www.OldFirehouseWinery.com . We paid for a tray with 11 small samples on, and sat out in the sun and tried them. All but a couple of whites were indifferent, one even reminding me of Polycell brush cleaner. In the end we decided not to buy a bottle of any of it and left for a sit on the tiny beach area close by. 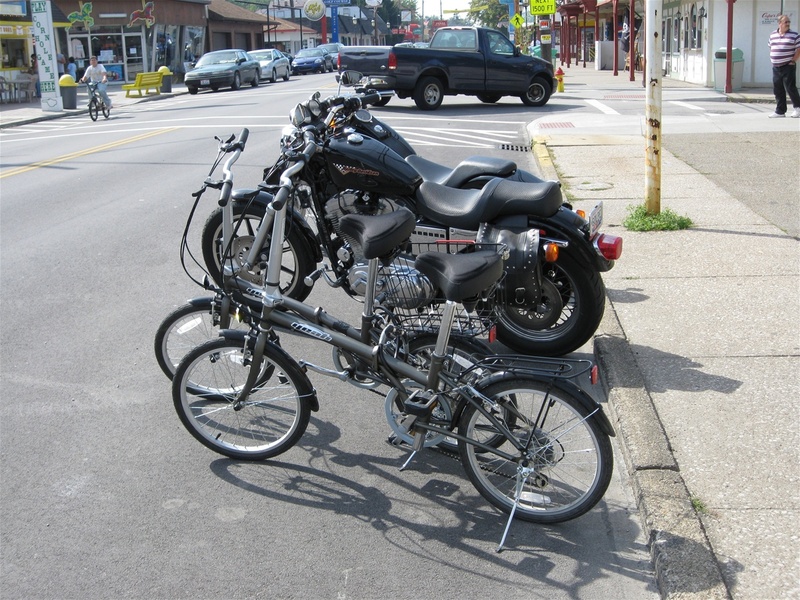 On the way back to the campground we stood our folding bikes at the end of a row of Harley Davidson motorcycles whose riders were parked up at a local bar, and then took a picture, those who were watching me could see the amusing side of it. I chose this campground because it had good reviews but we’re a bit disappointed. It really is a big site, too big, about 110 acres in all, so big that many Americans arrive towing golf carts behind them so that they can commute within the park – it’s big but not that big, they’re just plain lazy. We find legs or a bike work just as well. We even have golf carts travelling round the small artificial lake here in the evenings to watch or feed the ducks; it’s more like an evening stroll American style. We will be glad to leave here; it’s too noisy with crazy O.T.T. weekenders and has more yapping dogs than Crufts. Tomorrow we set out for Niagara Falls, visiting there Wednesday & Thursday all being well before we make our way over to Boston. We have no idea when we will have internet connection again. LOCATION TONIGHT: Indian Creek Camping Resort, 4710 Lake Rd, East, Geneva-on-the-Lake.